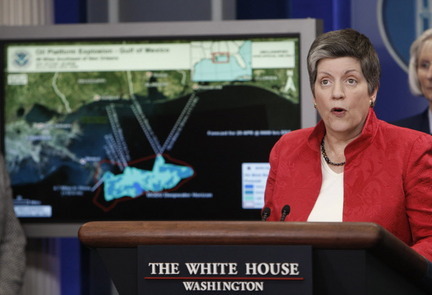 Homeland Security Secretary Janet Napolitano uses a map of the Gulf of Mexico during the daily press briefing at the White House in Washington, Thursday, April 29, 2010. A leaked memorandum obtained by the Press-Register on the unfolding spill disaster in the Gulf makes clear the Coast Guard now fears the Deepwater Horizon well site could be on the verge of becoming an unchecked gusher shooting millions of gallons of oil per day into the Gulf. "The following is not public," reads the National Oceanic and Atmospheric Administration's Emergency Response document dated April 28. "Two additional release points were found today in the tangled riser. If the riser pipe deteriorates further, the flow could become unchecked resulting in a release volume an order of magnitude higher than previously thought." Asked Friday to comment on the document, NOAA spokesman Scott Smullen said that the additional leaks described were reported to the public late Wednesday night. Regarding the possibility of the spill becoming an order of magnitude larger, Smullen said, "I'm letting the document you have speak for itself." In scientific circles, an order of magnitude means something is 10 times larger. In this case, an order of magnitude higher would mean the volume of oil coming from the well could be 10 times higher than the 5,000 barrels a day coming out now. That would mean 50,000 barrels a day, or 2.1 million gallons a day. It appears the new leaks mentioned in the Wednesday release are the leaks reported to the public late Wednesday night. "There is no official change in the volume released but the USCG is no longer stating that the release rate is 1,000 barrels a day," continues the document, referred to as report No. 12. "Instead they are saying that they are preparing for a worst-case release and bringing all assets to bear." The emergency document also states that the spill has grown in size so quickly that only 1 to 2 percent of it has been sprayed with dispersants. The Press-Register obtained the emergency report from a government official. The White House, NOAA, the Coast Guard and BP Plc did not immediately return calls for comment made early this morning. The worst-case scenario for the broken and leaking well pouring oil into the Gulf of Mexico would be the loss of the wellhead and kinked piping currently restricting the flow to 5,000 barrels -- or 210,000 gallons -- per day. If the wellhead is lost, oil could leave the well at a much greater rate. "Typically, a very good well in the Gulf can produce 30,000 barrels a day, but that's under control. I have no idea what an uncontrolled release could be," said Stephen Sears, chairman of the petroleum engineering department at Louisiana State University. On Thursday, federal officials said they were preparing for the worst-case scenario but didn't elaborate. "I'm not sure what's happening down there right now. I have heard there is a kink in what's called the riser. The riser is a long pipe that connects the wellhead to the rig. I really don't know if that kink is a big restriction. Is that really a big restriction? There could be another restriction further down," said LSU's Sears. "An analogy would be if you have a kink in a garden hose. You suspect that kink is restricting the flow, but there could be another restriction or kink somewhere else closer to the faucet. BP Plc executive Doug Suttles said Thursday the company was worried about "erosion" of the pipe at the wellhead. "The pipe could disintegrate. You've got sand getting into the pipe, it's eroding the pipe all the time, like a sandblaster," said Ron Gouguet, a former oil spill response coordinator for the National Oceanic and Atmospheric Administration. "When the oil is removed normally, it comes out at a controlled rate. You can still have abrasive particles in that. Well, now, at this well, its coming out at fairly high velocity," Gouguet continued. "Any erosive grains are abrading the inside of the pipe and all the steel that comes in contact with the liquid. It's essentially sanding away the pipe." Gouguet said the loss of a wellhead is totally unprecedented. "How bad it could get from that, you will have a tremendous volume of oil that is going to be offgassing on the coast. Depending on how much wind is there, and how those gases build up, that's a significant health concern," he said. The formation that was being drilled by Deepwater Horizon when it exploded and sank last week is reported to have tens of millions of barrels of oil. A barrel contains 42 gallons. Smullen described the NOAA document as a regular daily briefing. "Your report makes it sound pretty dire. It's a scenario," he said, "It's a regular daily briefing sheet that considered different scenarios much like any first responder would."